The impact of alcoholism on families can be financially, emotionally, socially, legally, and spiritually devastating. Luckily, many rehab treatment centers help heal whole families. Alcoholism is an addiction that has affects on the entire family, not just the afflicted, by creating family loss and trauma. 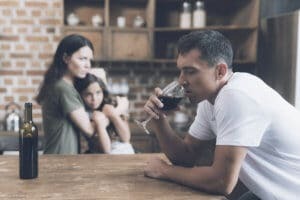 As the millions of American families who have been torn apart by this deadly disease will attest, the impact of alcoholism on families is universally negative. The physiological symptoms of alcohol abuse range from flushed skin and slurred speech, to stumbling when walking. Individuals will suffer other risks from excessive alcohol consumption ranging from injuries, drunk driving, and reckless behavior. Those battling alcoholism succumb to drinking alone in secrecy, hangovers, blackouts, mood swings, or irritability that often accompany drinking. Family members can also see other disturbing traits first hand. A common side effect of alcohol abuse is aggression and violent behavior. Therefore, those who drink regularly are likely to express aggression and can cause conflict with family members. If someone drinking alcohol drives drunk, they can severely injure themselves or others, putting another’s life at danger. Furthermore, death can occur, destroying families. Adolescent drinking is another problem that plagues many teens in America. They are in various stages of development and often struggle with social and emotional distress. Peer pressure often encourages early alcohol use, as friends or parties offer alcohol without judgement. Early juvenile drinking can produce an early alcohol tolerance, consequently encouraging more alcohol use. By the time the student enters high school, he or she can have a higher tolerance or develop a dependence on alcohol. Parents may find it extremely difficult to connect with their children as they hang with new kids who encourage drinking and possible drug use. Above all, children may rebel when family cause trouble and create friction between the adolescent and their relatives. Despite the boundaries between different levels of alcohol consumption, alcohol consumption can impact family and friends. Alcohol’s ability to impact one’s brain and go directly into one’s bloodstream make it a powerful, but destructive substance to overindulge. Individuals who drink are more likely to overspend as drinking can cost large sums of money. Due to the expense of drinks, and the frequency of consumption, someone can spend between $20 or $300 per sitting. Once someone is intoxicated, they can lose complete control over their finances. As a result, the money they spend on drinks instead of paying bills can be extremely straining to family members. Adults who suffer from alcohol dependencies can avoid responsibilities such as work and family duties. Likewise, they can perform poorly in their careers, risking job loss, allowing their family to suffer a major financial loss as they feel responsible to support them. Mothers using alcohol to self-medication underlying disorders like depression or anxiety should get help before conditions worsen. Contact a treatment expert today. It could help you, your baby and your family. Alcohol abuse is a complex habit which impacts family members as well as individuals in numerous ways. Luckily, there is hope. Treatment experts can guide those struggling with addiction to the best facility centered on re-establishing broken relationships, while healing underlying conditions.